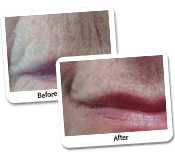 This women wanted to have removed the vertical wrinkles above her upper lip. She is wearing lipstick which enhances the result after having Erbium laser resurfacing of her upper lip and a Filler into the lip edge for volume. At the Dr Lanzer Clinic, we like to provide prospective patients with as much information as possible before making their appointment at our clinic. Information can help patients to learn more about their treatment and determine whether the treatment can provide them with a solution or not. One of the ways through which we provide information is our case studies. The case study on this page, for example, was taken from one of Dr Lanzer’s patients with her permission. Patients who are considering face laser resurfacing can gain valuable information about the treatment by reading the case study information below. So, be sure to read on if you want more information before your appointment at the Dr Lanzer Clinic.What Face Laser Rejuvenation and Accompanying Procedures Were Executed for the Lady in This Case Study? The lady in the above photograph had Erbium laser resurfacing of her upper lip and a filler into the lip edge for volume. Cosmetic and dermatologist surgeons often combine laser resurfacing for the texture with a filler for the volume effect. What Causes Wrinkling of the Upper Lip as Seen in This Case Study? Wrinkling on the lip can happen for a number of reasons. One is constant facial movements such as people who smoke or speak by pursing their lips. This causes textural change, which can be improved or removed with laser resurfacing. The second cause of ageing of the lip is the loss of volume, particularly around the lip margin. As the lip collapses the wrinkles become more obvious; this is particularly common if there are some dental changes and if patients have false teeth. 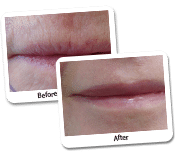 Lip enhancement can be performed with temporary and more long term Fillers. Dr Lanzer always prefers to use temporary fillers first and then a more long term filler if required. What Type of Laser Does Dr Lanzer Use for Laser Resurfacing Procedures? Dr Lanzer has been performing Laser Resurfacing since 1994. He was one of the first in Australia to use the Ultra Pulse C02 Laser. Over the last 10 years, he has switched from that laser to the Contour Erbium Laser, which he finds more effective and safer in his hands. 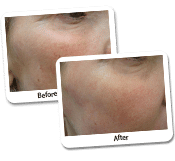 The Contour Erbium Laser works by vaporising the skin away and has a specific attraction to the water in the skin. Once healing occurs in about five to seven days, the skin is slightly pink and make up can be applied. The photograph shows that this lady has a little bit of lipstick on her lips which enhances the result. You will notice, however, that the vertical wrinkles on her upper lip have totally gone.